I have to admit at getting a few rather strange looks as I made my way along sheer ice paths through Farnham town centre at first light with my fishing tackle on Sunday morning. Was I mad or just mad keen, the former I think especially when I felt my legs go from under me? Luckily my rucksack broke my fall and after dusting the snow off continued my journey. Settling in the park I soon had a delicate stick float approach set up and after a few minutes spent priming the swim with maggots mad my first cast. Half way down the float buried, however the expected dace turned into a big chub and as I was just about to net it the hook pulled leaving the end tackle up a tree. Not a great start, and one sure to kill the swim, yet a few good dace did grace my net and the artic image I wanted was captured, although far from perfect as snow flakes were hitting the lens and all feeling in my fingers were long gone. Having got my angling fix over the weekend, Monday and Tuesday were spent in the garage sorting through the kit. It was a well overdue job and in a way the weather was a blessing as it allowed me to wade through rods, reels and tackle boxes. Come Tuesday evening I had at long last managed to sort different set ups for a number of species including pike, perch, zander, chub, barbel and roach and for once in my life felt quite organised. Wednesday I was thinking about checking out a venue for some oversized dace, yet with the snow melting and knowing that this and the salt of the roads would be in the river, knew that trying to locate these would be almost impossible, so once again spent the day getting a few overdue house duties out of the way. Thursday I was booked in with the Tight Lines crew. Ide were on my hit list, however with the lakes frozen headed to the river Wey at Farnham as in such tough conditions needed a venue that would give me half a chance. Once again the river was cold and clear and the banker swim in the park produced the goods with a least a dozen good dace and two trout. Heading upstream I tried to put a good chub on the bank using bread flake, and for the second time in a week found myself flat on my back, yet an over enthusiastic pounder got to it first. A few good dace also came to the float, so it was a successful day. Friday the alarm sounded at 6am and with the conditions still cold finally managed to get a planned guiding session in. This time it was with a new customer who although had fished for barbel had never specifically targeted chub. Although the Loddon was suffering from snow melt and slightly high it was still relatively clear so we headed straight for the best swim and with fifteen minutes had a modest chub of around 3lb 8oz in the net. The next four swim proved fruitless, yet another swim upstream once again produced the goods with a similar sized chub. Looking back both swims were the same that l caught from a week or so earlier, seems the rivers becoming predictable, however its scary that many others that used to be so good are now fishless! One more swim was tried without any joy before we headed to the Blackwater. I had four swims earmarked and although the first failed to produce, the other three did. The best chub wasn’t quite four pounds, the other an old warrior and the third unfortunately came off. Trying the first swim again, the expected bite came but was missed. Chub fishing, predictable or what! This weekend the weathers going to change. My barometer is falling quickly which usually indicates a short change. In a way I hope this is the case, as the mild air will defrost the lakes making them fishable and although the rivers will probably go into flood with the expected rain, once the cold air return then the fishing should be good. Let’s just hope when the cold returns it’s not as severe as in previous weeks. Top tip and lessons learnt. Bread fishing for chub when it’s really cold is brilliant, however it is relatively predictable. Nine times out of ten a bite will come within fifteen minutes of casting out so make sure everything around you is to hand. I even pour a cup of tea before casting out as it only takes one hand to drink this, but two to pour it, and you can bet on the bite coming when your pouring it. Hold the rod at all times, supporting it on a rest if needed and never take your eye of the tip. This lesson was learnt years ago. When it’s really cold small fish aren’t a problem so the smallest of tremors or taps is usually from a big fish. As soon a sign is seen be ready as the bite will come soon after. The Famine before the feast. Being the girlfriend’s weekend off and having to dog-sit till Monday morning, fishing activities were minimal with just an introduction of bait spodded into the venue I’m pre-baiting on Sunday. Monday was spent completing part 3 of my mini series the 'Pellet/Groundbait Lead' for Coarse Angling Today whilst watching the snow and temperatures fall. Tuesday I headed to the river for a spot of chub fishing, yet with all my experience I should have known it was going to be in a terrible state, running high, coloured and cold. I tried two banker swims without any joy, so returned home, took a few images for a feature before heading back to the pre-baited lake, this time with my tackle. The temperature was just 2.5degrees on arrival and even before darkness descended ice was forming on my tackle. I have to say I wasn’t full of confidence, why? Well a few years ago I remember spodding some bait out and noticed that on retrieval loads of bubbles were left on the surface that took ages to disappear. That night I caught absolutely nothing and it was during a very prolific period. Well after spodding around fifteen loads out, the swim was once again full of bubbles and come 7pm just one bleep had come. If I had gone with my instincts then I wouldn’t have fished the river or lake, yet I always work on the theory that if you have a bait in the water then you 're in with a chance. As much as I wanted to get out on Wednesday I didn’t due to a meeting with my accountant, the weather was also taking a drastic turn for the worse. Tight Lines called to see if I was free to create a short film for the show, yet due to the following two days booked for guiding I had to recline the offer. Hopefully in the next couple of weeks I will be out with them though trying to catch a species I have never caught before. In the end it was a day catching up and doing jobs such as backing up images, clearing the email and computer database, as well as beginning to think of promoting guiding trips for later in the year. The day flew past and a quick look at the lakes on route to collect the girlfriend found them to be frozen. When I returned home I had to cancel not only Thursday and Fridays guiding but also a days perch fishing on Monday. Rarely have I ever known the weather to be so bad as normally if its cold and the lakes are frozen then the rivers are bang on chub form, but with the ground saturated, any rain or snow just sees them rising rapidly and colouring up with cold water, a killer. I have to admit it, apart from a spot of dace or roach fishing on small rivers close by, and that wont even be very good, I feel for once almost lost for options. Wednesday night the temperature dropped to a chilling -6 and although I thought about heading for the Loddon with bread on Thursday morning, I knew it would be a waste of time so I stayed at home, turned the heating up and compiled a couple of articles for European magazines. Having had to cancel three days guiding and missing out on a Tight Lines feature I know money will be tight come the end of the month so sometimes you just have to look elsewhere to get the pennies coming in. To be honest come the evening I felt that I had managed to really get on top of things, so when the weather turns for the better I can get out and make the most of it. The snow started to fall Friday morning so it was another day in the office, yet the tackle is by the front door as if the roads allow I’m off to the river for a spot of chub fishing Saturday morning. Leaving home at 8.30am I nearly didn’t make it to the river as the road leading to it was a sheet of ice, yet crawling at snail speed I eventually made the car park. Being the first to tread the snow covered fields I knew the chub would be feeding, yet it wasn’t as easy as expected, probably due to the Goosesander .hunting the river. Two bites were forthcoming yet although welcome they weren’t the monsters I hoped for. With no let up in the weather, the next few weeks aren’t going to be easy. Don’t ever think it’s too cold to catch. As long as the river is running clear then chub will feed. Bread is the best bait in such conditions. The set-up I use is simple, just a tiny 10gram cage feeder running on 6lb line. This is buffeted by two small float stops, which allow the length of hooklink to be altered, and a barbless size 6 hook completes the rig. Bites are usually soon after casting so hold the rod. The lesson learnt this week is not to rush to the river if we have had any rain or snow melt. In previous winters when the ground hasn’t been saturated a day of light rain hasn’t made to much difference yet this year and rain goes straight into the river, raising the level, speeding and colouring it up and reducing the temperature. Zander Sessions at Old Bury Hill. March is often the best time to catch a massive zander and I have a few spaces to cater for angler during the last two weeks of the traditional season (1st to the 14th). These sessions include tactical tuition as well as the opportunity to fish for them into the hours of darkness. These guided sessions are restricted to two anglers per session and the cost is £100 per person, which includes day tickets, bait, terminal tackle and the supply of rods etc, if require. Possible changes to the fishery mean that fishing for these magnificent creatures maybe restricted in the future so if you have been thinking of spending an evening on this prolific venue, then you need to contact me very soon. Overnight Catfish Sessions at Bagshot Lea Big Pond. March, April and May are the best months to catch catfish, as they are just waking up after lying dormant for the winter. These guided sessions include all bait and terminal tackle (rods and reels also available on request at no extra charge) plus guest tickets and will commence a couple of hours before dusk to 9am. Tutorial will include rig explanation, bait application, fish welfare and handling. Sessions are restricted to two anglers, at a cost of £100 per angler. For details of availability either email me at duncancharman@me.com or call me on 01252 315271 – 07928 617006. Last year I took my first tentative steps into guiding on the amazing river Wye. A week in September and another in October were booked and the response as well as the fishing was simply amazing. Those two weeks saw over one hundred barbel landed between the anglers as well as countless chub. The most barbel caught by one angler was sixteen with two others taking fourteen apiece! Through popular demand I will be guiding once more on this fabulous river and the weeks that I have put aside are – September 2nd – 6th and Sept 30th – Oct 4th. The cost includes all bait and terminal tackle (rods, reels are available if needed at no extra charge), tea and coffee whilst fishing as well as the day ticket price. The stretch of river that I fished last year is very private and scenic and anglers can if booking more than one night spend the night under the stars. The stretch has what’s known as a banker swim which is great as if two friends decide to fish then they can swap over during the day which guarantees they both catch. I can also book you into local B&B if you require a more comfortable night. If you did join me last year and fancy a change of scenery then this can be organised as well. The pike fishing on the Wye is also exceptional and it’s probably the best river in the country that gives you the chance of catching a 30lb plus specimen. Pike fishing starts on the 1st October and once again I know a few prolific stretches, so if you fancy a days barbel fishing then the following trying to catch a monster pike then l can accommodate. Dates have already started to go so if you are interested then either email me duncancharman@me.com or call me on 01252 315271 or 07928 617006. Cost per person is just £125 and is based on a maximum of two anglers per day. If you fancy joining me on for a days pike or barbel fishing on the Wye but the dates shown are not suitable then please call me, I’m sure we can sort out a convenient date. I would love to say that I am back to normal and in the swing of things again, yet this weeks been a bit of a unusual one as I have been looking after the girlfriends parents dog. I did manage to put a few hours aside over the weekend to organise my tackle for the week which included chub, perch and roach as well as sorting out a feature called ‘Beating the Freeze’ for Anglers Mail. I also managed to pre-bait a still water on Sunday evening on a tip of from a carp angler; however I’m not revealing the species I’m targeting until results start to come in. Tuesday and Friday were supposed to be my main fishing days for the week and after doing the necessary jobs on Monday to free these up managed to get an early start the following morning. Heading for a new stretch of the river Loddon I arrived to find the river free of anglers, worrying somewhat when its one of the best big chub stretches on the whole river. In brief, I roved the river for seven hours using breadflake tactics, covering all the likely looking areas throughout the beat for not so much as a tap. The stretch looked uninspiring and lacked features and only one swim looked as if it had been fished. I will return though as I know it contains chub that will smash my personal best, however I will probably only spend a morning on this stretch before moving onto another one which I fished a few years ago. Wednesday evening I was once again on a pre-baiting mission and managed to get out for a few hours at dusk the following evening after completing the Anglers Mail feature. I wanted to do this feature on Gold Valley as I was confident of putting together a 20-30lb bag of quality perch and roach but at the last minute this had to be changed to a river. The river Wey through Farnham is always good for a few fish, yet with this running clear and cold there was never going to be a big bag of dace and the chub were always going to be difficult and after three hours trotting a dozen or so dace to 8oz had fallen as well as three chub to 3lb 8oz and a trout. Paul Garner stopped of for a chat on his way back from Essex which was good. Back at the pre-baited venue I managed to get a kilo of hemp and maggots out before darkness fell as well as rigging the rods up and marking these to the pre-bait distance. I wasn’t expecting much and had already decided that a bite would be a result and come 7pm when I called it a day, two had come. The first I’m sure was from a small fish, yet the other saw the indicator dancing before falling to the ground, yet the self hooking helicopter rig failed to do its job. This was definitely from a good fish and I decided to leave the perch along the following day and return to see if I could find out what had found the free bait. Friday saw the temperature drop sharply and the easterly wind didn’t do much for my confidence, however after baiting up I dropped my rigs over the top and sat back. Just into darkness I saw two good fish roll and a single bleep had my hand hovering, yet I had to wait a while before the next indication and this time the heli-rig did its job. Far out I could feel the headshaking of a big fish and when she slid into the net I knew that my pre-baiting efforts had been worth while. Two more fish followed as well as a tiny perch before I decided to call it a night, slightly later than what I had planned. Certainly a tough week, but one that finally rewarded me. Lessons learnt and top tip. Since the Spomb came onto the market I have to say that I thought that I would never use a spod again, but I have to say I was wrong. My smaller of the two Spombs seem to be somewhat unreliable, often opening up in mid flight. I found myself half filling this, as overfilling only encouraged it to open, yet I also found myself dropping it short of the mark as I was afraid to cast it hard. I finally binned the small Spomb and reverted to the larger one, but after pre-baiting started to think that although it got a lot of bait out quickly, discreetly and efficiently, was it to accurate? I have now reverted back to a small spod and to be honest feel much more confident now. I might loose a bit of bait on each cast, but when the spod lands I can ease this back, spreading my bait over a bigger area. This might not be as tight, but how tight do I want my bait, especially when fishing after dark and casting quite a distance, often in a cross wind and when regular casting often brings a bite. Since reverting back to the spod I feel far more confident and comfortable with my bait application, something that’s very important when it comes to catching. 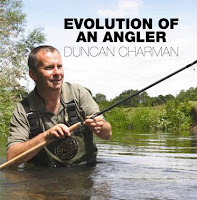 I have just had my first months sales report in regarding my book 'Evolution of an Angler' and they exceeded my expectations. If you haven't already bought your copy then it can be ordered from the publishers Calm Productions (www.calmproductions.co.uk) or their are a few signed copies still available at Yateley Angling Centre. What with New Years Eve and Day, fishing this week has been limited to the back end of the week. Unfortunately, although the weather looked and felt fine, even good enough for a red letter day, one factor was working against the angler and that has been atmospheric pressure. I remember a spell a couple of months ago that was similar, mild and dry with cloud cover and a westerly, yet with atmospherics hovering around 1035mb the fishing was terrible, and this week has been similar. Wednesday wasn’t too bad as the atmospherics were still rising. I was out guiding with young Jake, who wanted some practice catching and handling pike, so we headed to Frensham Small Pond a usually productive lake holding plenty of jacks. Arriving at around 8am we headed straight to the dam wall as nine-times-out-of-ten this is where the pike have shoaled the roach up, yet after an hour and a half we knew we were in the wrong place as pike could be seen chasing fry half way up the lake. Jake asked me what I would do in such a situation and I said move to the fish, so that’s exactly what we did and within ten minutes of casting out Jake was posing with a nice pike. The action was steady with a further six pike being netted along with around the same either missed or lost from hook pulls. It was a great day out where Jake leant loads including how to mount baits, make traces, the importance of a recast as well as handing pike out of the water and unhooking. Thursday I had planned a whole day perch fishing with my brother on a new water, yet a feature for Anglers Mail had me working overtime. The day was rescheduled and the venue changed to our more local Gold Valley Lakes where l finally caught up with him early afternoon. He was happily catching quality roach and perch on the float in the main lake and I roved around trying to find a few larger specimens on Bungalow, yet my efforts went unnoticed. It was when I went to write up my daily session report that l noticed how high the pressure was and instantly knew why the fishing wasn’t as good as I had expected. I should have gone chub fishing the following day, as these don’t seem to be as affected as other species are with pressure levels but instead headed to Old Bury Hill with zander on my mind. Arriving mid afternoon it soon became apparent that the fishing was slow, yet a carp and two bream to the carp anglers proved fish were feeding and with small fish dimpling the surface at dusk my hopes were high. Come 7.30pm all confidence had gone and with four other zander anglers catching just one zed between them we all packed up together blaming the atmospherics for the lack of action. Top tip and lessons leant this week. I leant the importance of moving to showing fish many years ago but it was a great lesson for young Jake to witness this first hand. If we had stayed in our initial swims we may well have gone home on a blank. If you look at the image of Jake sitting on the dam rod next to our rods and look up the lake you can see where two pike have just struck! Top tip for the week is to arrive as early as possible and watch the water as fish often give their location away at this time of the day. I even moved from my normal tried and tested swims at Old Bury Hill on Friday evening to an area that’s not often fished as l thought that the pressure might not effect shallow water as it did deep, yet this made no difference at all, however at least I headed home knowing l had made the effort.